Two recent Airbus A320 gear up landing accidents in Italy prompted EASA to demand tougher inspections. At the same time, the Italian accident investigation board ANSV issued four safety recommendations to EASA. ANSV is currently investigating two accidents involving Airbus A320 passenger planes at Roma-Fiumicino Airport (FCO) in 2013. 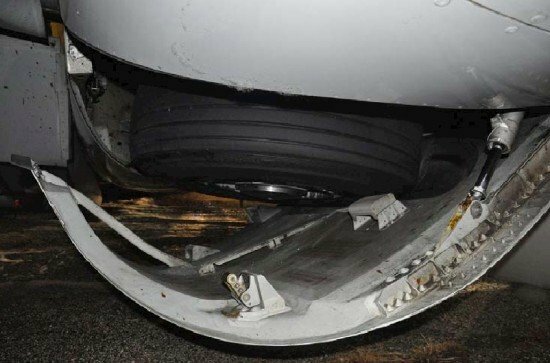 On June 8 an Wizzair A320 encountered problems when the crew selected the gear down during the approach to Rome-Ciampino Airport. The left main gear only partially extended and remained stuck. An emergency landing was carried out at Fiumicino Airport. On September 29, an Airbus A320 operated by Alitalia developed similar problems, this time with the right main gear only partially extending on approach to Rome. This aircraft also made an emergency landing at Fiumicino Airport. Preliminary investigation results of the Alitalia plane indicate that the right hand main gear actuator was jammed. An X-Ray analysis revealed the presence of heavy debris in the damping housing. A retaining ring was found ‘out of the design position’. An analysis of DFDR data showed that the undercarriage locked down without delay on previous flights. No fault messages were found. Several airworthiness directives have been issued since a similar occurrence involving a United Airlines A319 at Newark in January 2010. EASA now issued a new AD that retained the requirements of EASA AD 2011-0069R1 and AD 2013-0132-E, which are superseded, but with reduced inspection intervals, and requires replacement or modification, as applicable, of the affected MLG door actuators as terminating action for the monitoring, repetitive checks and inspections. At the same time, ANSV issued four safety recommendations to EASA. Amongst others, ANSV recommends EASA to require additional checks of the hydraulic system of the landing gear doors when replacing an actuator, to make sure that there is no contamination present. ANSV also recommends X-Ray inspections of actuators.